Cheers! I'm looking forward to making this one! or I sometimes use this one, which I get from my local supermarket. yes, i use the cremovita one too. I have never seen those before o_O but I will look! Thanks! Well I've never cooked sugar like that before! Was a bit scary. Ate some shortly after making it and it was gooey and sickly but still nice! Much better this morning after being in the fridge. Interested to hear you found the cream in Tesco's - is it a very big branch? Thanks for the tip-off danaeonyx - we do have a big one a couple of miles away so a trip to it might be called for. Don't say that! I feel guilty! I have a carton of Cremovita and a carton Soyatoo (which I think are pretty much the same thing - Taste/Ingredients/Nutrition), I'm planning on making myself a trifle for Easter Sunday lunch and using Cremovita on top (it needs to be used first cos of the use by date), but I've just been and bought some Strawberrys which would taste great with Cremovita. Does anyone know how long the Cremovita lasts once it has been opened? Would I be able to open it tomorrow for my Strawberrys and use the remainder on Sunday or would it have gone off by then? Thankyou twinkle I will try that, if it does go funny by Sunday I will just have to open the other carton, but I think that your way should be OK! Does anyone know if this product is still available in the UK? 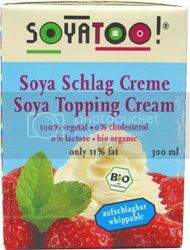 If so, where, and if not is there an alternative soya whipping cream available? Thanks.